Gregory Efimovich Rasputin, also known as Rasputin, a semi-literate peasant from Siberia, was a Russian personality during the early twentieth century who gained fame and influence within the Tsar's government as a confidant to the Empress Alexandra and as a healer of her son the Tsarevich Alexei. As such he was able to assert influence within the Church of Russia during the early years of the twentieth century. His association with the household of Tsar Nicholas II brought discredit upon the tsarist government during its final years in power. Much of Rasputin's life is cloaked in mystery and legend. Little is known of his life as a youth. His life as an adult is confused by varying accounts by his family and his opponents. He has been referred to variously as a "Mad Monk," as a "strannik," as a "saintly mystic," a "visionary," a healer, a prophet, and a debauched religious charlatan. Controversially, since the early 1990's, a faction within the Russian Orthodox Church connected with Metropolitan John of St. Petersburg has insisted that Rasputin was a saint, and lobbied for his formal canonization. If accepted, he would be referred to as "Martyr for God and Tsar Elder Grigory Novy." Rasputin was born the son of the peasant Efim Novykh, in the village of Prokovskoye, in Siberia, which is on the banks of the Tura River in what is now the Tymen Oblast. His date of birth had been in dispute until recent documents surfaced that placed it on January 22, 1869 (NS) January 10 (OS). His elder sister, Maria, and younger brother, Dmitri, both died as youngsters, Maria by drowning and Dmitri of pneumonia after falling into a river. Their deaths apparently affected Rasputin as he named two of his children after them. During his youth, Rasputin gained a reputation of super natural powers when he allegedly identified a horse thief by paranormal powers. He also gained a reputation as a rake, a man with a debauched and endless sexual appetite. In his late teens he stayed at the Verkhoturye Monastery for three months after which he turned to a life as a religious mystic and wanderer. During these years he came into contact with a banned cult known as the khlysty (Flagellants) the members of which believed the only way to reach God was through sinful actions. Soon he began to adopt the robes of a monk. The association with this group would follow Rasputin for the rest of his life. He also visited Makariy, a holy man would lived in a hut nearby, who influenced Rasputin greatly. In 1889, Rasputin married Praskovya Fyodorovna Dubrovina, by whom he had three children named Dmitri, Varvara, and Maria. He also sired another child with another woman. In 1901, Rasputin left his home as a pilgrim, journeying through Greece and on to Jerusalem. In 1903, he arrived in St Petersburg. There he developed a following as a "starets" among some of the aristocracy, including the Grand Duchesses Militza and Anastasia and Alexandra's companion Anna Vyrubova, with healing and prophetic powers before he returned to Siberia. By 1905, Tsarina Alexandra, who had been searching for help in controlling the hemophilia of the young Tsarevich Alexei, appealed for help from Rasputin through her trusted friend, Anna Vyruova. 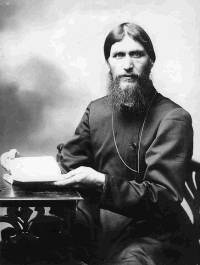 Rasputin was said to have been able to ease the suffering of the Tsarevich in St Petersburg by prayers from Siberia. Each time Alexei suffered an injury, Rasputin's intervention at the request of Alexandra seemed to result in improvement for the young Tsarevich, giving the appearance that Rasputin was effectively healing him. Nicholas and Alexandra, thus, developed a trust in Rasputin, where the Tsar would often refer to Rasputin as "our friend" and as a "holy man." Rasputin developed considerable personal and political influence over Alexandra. Nicholas and Alexandra considered Rasputin to be a man of God. Rasputin gained the position that anyone who desired an audience with the Tsar or Tsarina had to go through him, thus angering people who previously had freer access to the royal couple. Rasputin fascinated many of the St Petersburg elite. He was widely accepted by them. As World War I progressed, his influence over the royal couple increased. After Nicholas took personal command of the army along the fighting front, Rasputin became the chief advisor to the Tsarina Alexandra. Through his close relationship with her Rasputin was able to place many who were his friends in positions within the government and in the Russian Orthodox Church. A very tense relationship developed between him and the Russian Orthodox Church. His influence, through the Tsarina, enabled him to take control of the Holy Synod when Nicholas would only accept Rasputin's recommendations for the office of Ober-Procurator. He engaged in public disputes with the clergy, thus increasing the animosity of the Church toward him. The Synod of Bishops would accuse him of a variety of immoral and evil practices. Using his influence with the royal couple, he knew how to undermine his enemies in the church and have them exiled or disgraced. Bishops or monks who opposed him would find that they were suddenly sent to a remote monastery or distant episcopal see. It was through Rasputin's maneuvering that the president of the Holy Synod, Metr. Vladimir (Bogoyavlensky), was moved to Kiev and replaced as Metropolitan of St Petersburg by a Rasputin crony, Abp. Pitirim (Oknov). He maneuvered the installation of the very aged Makari (Nevsky) as Metropolitan of Moscow, and Varnava (Nakropin) as bishop of Tololsk, and then had all three made members of the Holy Synod. Side entrance door to Prince Yusupov's Moika Palace private entrance used on the night of December 16, 1916. The intense animosity by members of the Russian nobility toward Rasputin and his relationship with Alexandra reached a critical point in 1916. Among these nobles, the Grand Duke Dmitri Pavlovich, Prince Felix Yusupov, and Vladimir Mitrofanovich Purishevich began plotting to kill Rasputin, an act that has become legendary, the true facts of which have remained confused by inconsistent statements, even by the participants. On the night of December 16, 1916, a group of nobles, including Yusupov and Pavlovich, lured Rasputin to the Moika Palace residence of Yusupov. During the night after serving him poisoned cakes and wine and being shot a number of times, Rasputin's body was thrown in the Neva River where it was found three days later. By direction of Alexandra his body was buried at the Feodorov Cathedral in Tsarskoe Selo on December 22, 1916, but it was uncovered after the February Revolution and burned by a party of workers from St. Petersburg. This page was last edited on December 6, 2009, at 04:51.